Legal stuff counts. Legal stuff can make or break a business. Contracts don’t make fun reading, but they will save your bacon. We know law doesn’t set the world on fire and it might not excite you to the bone, this is your chance to ask WEDF’s designated lawyer, Jessica Bent, questions you never knew you needed the answer to, or questions which are burning at the back of your mind. 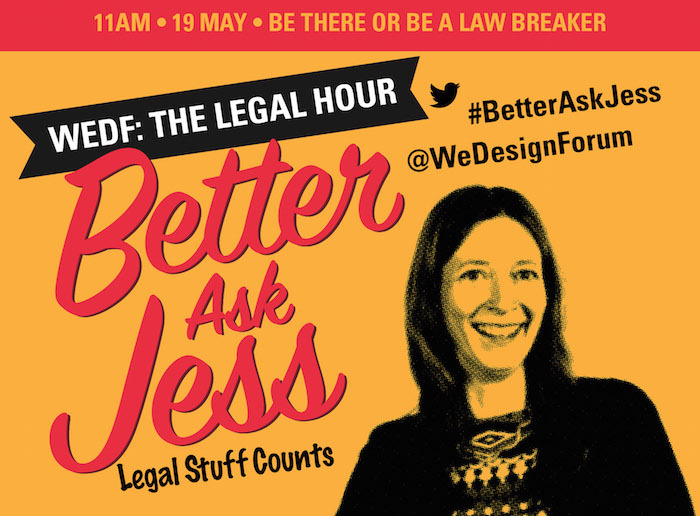 Just tweet them to @WeDesignForum and Jess will be tweeting answers during WEDF’s the Legal Hour. You are creating a new brand for a company. Who owns the rights to it? How do you make sure you get paid for your work? You are suggesting new brands to your client. Do you need to worry about other people’s trade marks? You are taking on your first employee. Do you need a contract? You’re setting up a company with some old colleagues. Do you need an agreement? A junior designer in your team has taken an image from the Internet – are there problems? You use lots of freelancers. Do you need a contract with them? You’ve been using the brand for your company for years. You then get a letter requiring you to stop using it. What can you do? So start thinking about your questions, post them in advance if you wish to @WeDesignForum and Jessica will do her best to give you some answers.